Maestro Tailoring & Fashion is located in Playhouse Square within Cleveland's historical theater district. As the district sets itself apart from most theater districts in the country, Maestro offers a unique experience in today's businessman's fashion. Mark Srour, founder of Maestro, has created a men's boutique that combines the traditional family tailor, rooted in quality and workmanship, with a keen sense of customer service where the needs and wants of his clients drives the passion of Maestro. 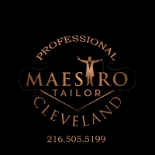 Maestro Tailor first came onto the Cleveland scene solely as a tailor in 2015 where clients came to Mark to have him create a better fit in their ready to wear garments. Mark first learned the trade of tailoring from his grandfather more than 20 years ago, and people trusted Mark for his expertise and passion for his work. During the first three years in business, Mark began to understand the frustration of his clients in finding a proper suit that fits them in a manner that evokes confidence and a sense of style. The story of his clients rang true over and over, again. If a suit is made with quality fabric and workmanship, then the style suffers, and they end up having a boxy suit. If the suit is more of a modern fit, then the fabric and workmanship is lax. As maestro Tailoring & Fashion evolved, Mark created his own line of ready to wear suits, which are all half canvas suits and made with virgin wool, to offer Cleveland a location to purchase suits where the quality matches the style. No need to go to department store after department store in search of that perfect suit. What better place to find a quality suit than one designed by a tailor who knows how a suit is to properly fit? Many men are drawn to the convenience of online shopping where they believe the offers are too good to pass up. The truth is that purchasing an online suit may not be worth the risk. Without touching the fabric, you can never be sure of the quality of the fabric. Furthermore, the sizing may vary slightly from one manufacturer to another, which can be very frustrating with online purchasing, so it is always best to try the suits on before making a decision. Mark is very happy to help you with your suit making process and explain what sets his suits apart from the others. Not only is Mark proud to show you his very own line of suits, he will also show you his own work in his bespoke suits. His craftsmanship of a bespoke suit is like none other. every detail of your next bespoke suit is designed by you and Mark to create a truly wearable piece of art. Whether you are in the market for your first bespoke suit, or your next suit to wear to the office, meeting, interview, or finding the perfect suit for your wedding, Mark will be proud to help you look your very best!